A CNC Machinist is involved in creating machine parts and tools using the Computer Numerical Control machines. 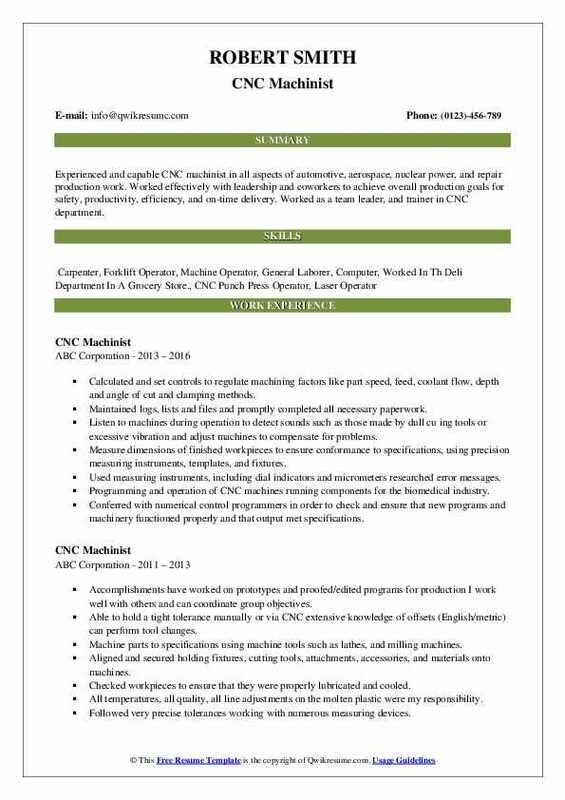 The following are the most commonly listed duties on a Successful CNC Machinist Resume – adjusting and maintaining all CNC machinery, creating programming instructions for the parts that are being manufactured; setting up and operating precision equipment, maintaining equipment to reduce possible downtime, running tests and replacing worn parts; inspecting and testing finished parts, creating programming documentation and making necessary updates and adjustments. 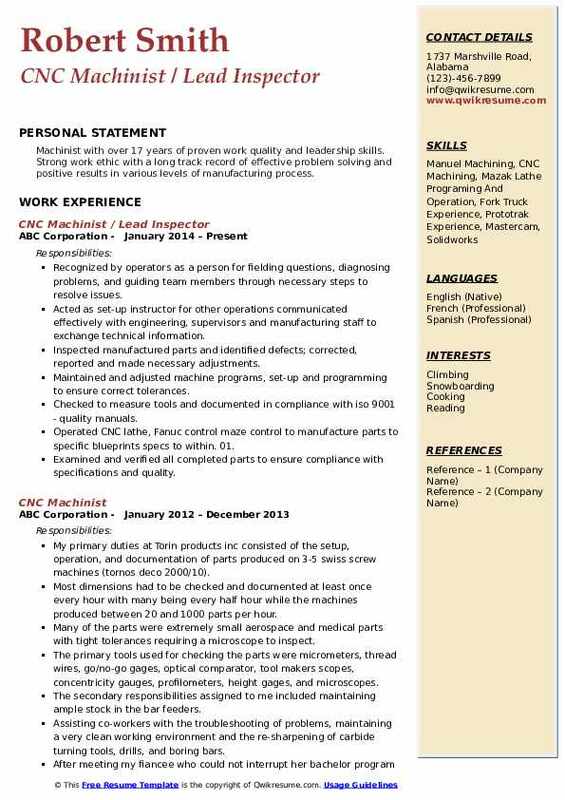 The list of required abilities for this position includes – a strong understanding of drill, lathe and milling equipment operations; the potential to set up and maintain production or manufacturing machines; reading schematics and blueprints, and a thorough knowledge of safety regulations pertaining to CNC equipment. While a high school diploma is the minimum education requirement, many employers prefer those holding a two-year degree program or certification from a technical college. 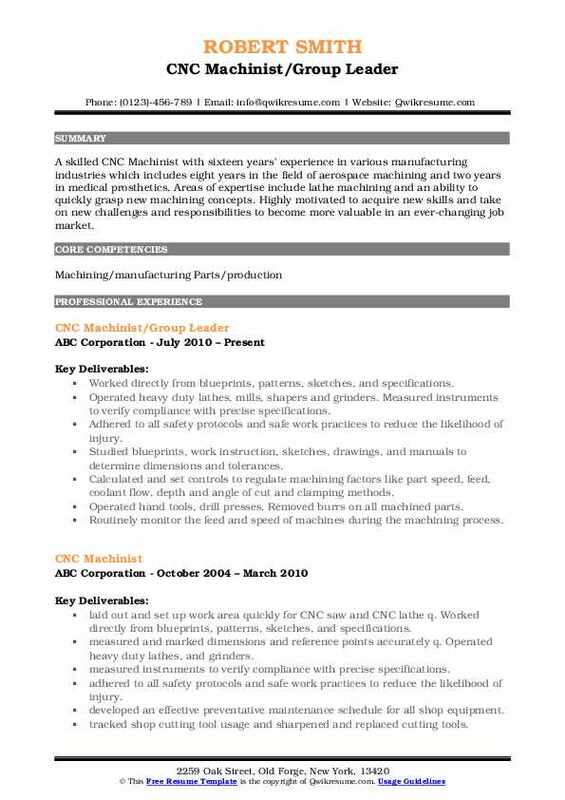 Summary : To secure a challenging position as a CNC machinist by using profound skills in handling CNC machinery and exceptional knowledge of manufacturing procedures. 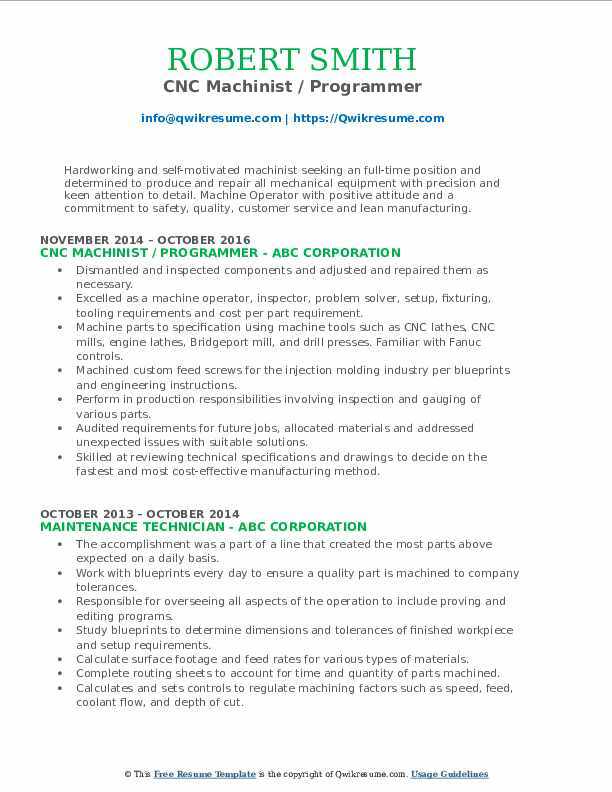 Skills : Operations Various CNC, VTL, Lathe, Mill. Good Knowledge Of G And M Code Programming Language. Ability To Understand And Read Blue Prints. Have Knowledge Of Geometric Dimension And Tolerance. Good In English And Vietnamese Communication. 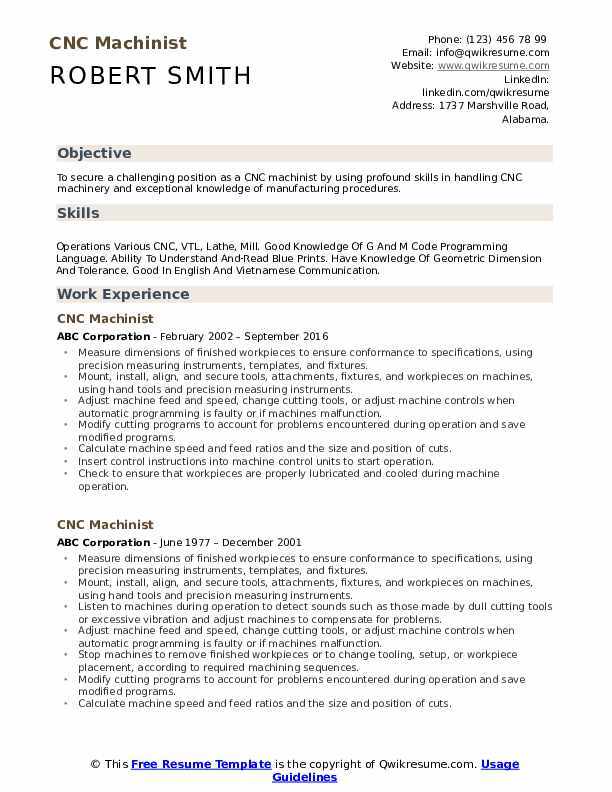 Objective : Efficient CNC Machinist with over 2 years of progressive experience in speed reducers and redactors in a manufacturing environment. Highly-skilled dedicated to producing oil and gas mechanical equipment with precision and strong attention to detail. Examine electronic components for defects or completeness of laser- beam trimming, using microscopes. First article inspect and spot check throughout process to insure quality of the part; assisted in implementing the hs&e safety program. Headline : Experienced and capable CNC machinist in all aspects of automotive, aerospace, nuclear power, and repair production work. Worked effectively with leadership and coworkers to achieve overall production goals for safety, productivity, efficiency, and on-time delivery. Worked as a team leader, and trainer in CNC department. Maintained logs, lists and files and promptly completed all necessary paperwork. Listen to machines during operation to detect sounds such as those made by dull cu ing tools or excessive vibration and adjust machines to compensate for problems. Used measuring instruments, including dial indicators and micrometers researched error messages. Programming and operation of CNC machines running components for the biomedical industry. Conferred with numerical control programmers in order to check and ensure that new programs and machinery functioned properly and that output met specifications. Summary : Skilled career professional with practical experience as CNC Machinist and Programmer on vertical and horizontal CNC mills. Programming using Mastercam X7 software, drawing, applying tool paths and editing programs. In depth understanding of G code, macros and subroutines. Great understanding of complex setups for a vast amount of parts. Ensuring quality by performing a first piece check using a variety of gauges including a cam and comparator. Ability to read and change CNC programs communicate with supervisor, engineers, quality control, and other shop personnel to resolve machining or quality issues. Carried out the metrics and mathematical conversions required to obtain the desired and specified final product quality. Problem solved relative to machine settings, tools & fabrication methods for high production processes. Safely operating hand/power tools and equipment, including lathes, shapers, grinders, and saws. Interpret blue prints to ensure that product meets customer specifications and proper tooling and gauges are being utilized. 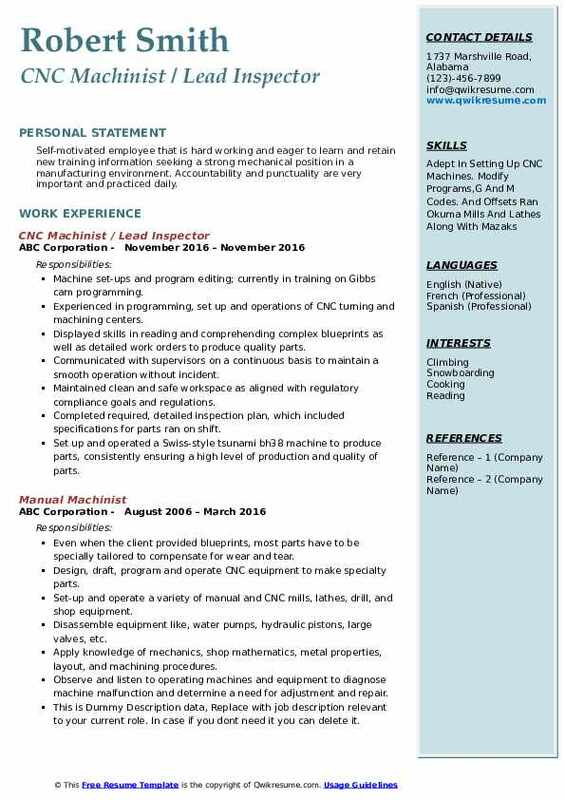 Summary : Self-motivated employee that is hard working and eager to learn and retain new training information seeking a strong mechanical position in a manufacturing environment. Accountability and punctuality are very important and practiced daily. Machine set-ups and program editing; currently in training on Gibbs cam programming. 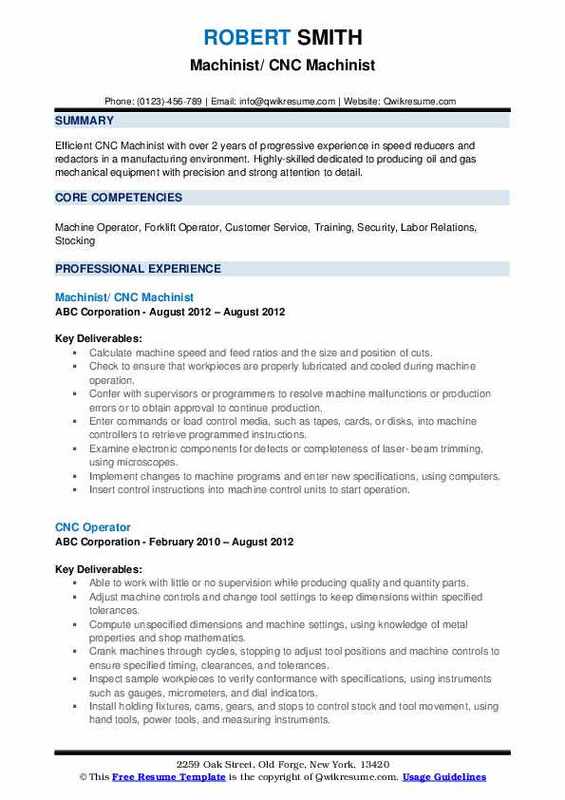 Experienced in programming, set up and operations of CNC turning and machining centers. Displayed skills in reading and comprehending complex blueprints as well as detailed work orders to produce quality parts. Communicated with supervisors on a continuous basis to maintain a smooth operation without incident. Maintained clean and safe workspace as aligned with regulatory compliance goals and regulations. Completed required, detailed inspection plan, which included specifications for parts ran on shift. Set up and operated a Swiss-style tsunami bh38 machine to produce parts, consistently ensuring a high level of production and quality of parts. Made appropriate offset corrections for tool wear, broken tools and casting variations. 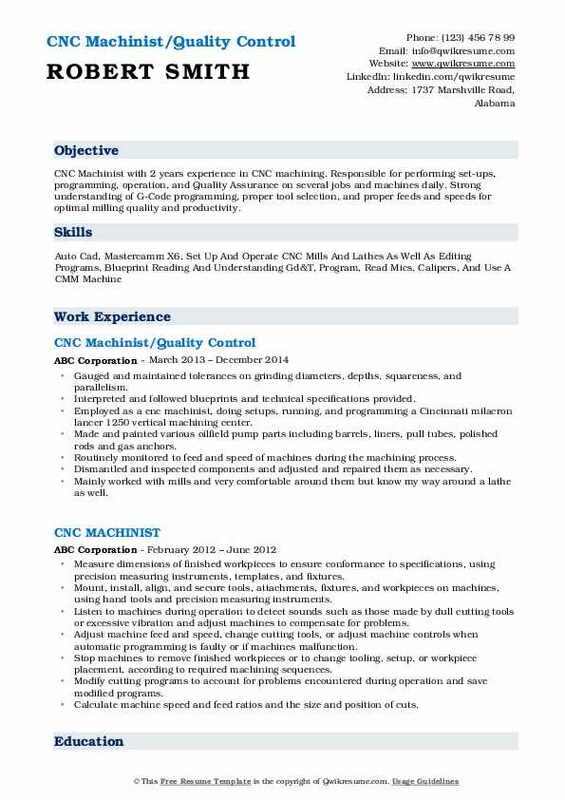 Objective : CNC Machinist with 2 years experience in CNC machining. Responsible for performing set-ups, programming, operation, and Quality Assurance on several jobs and machines daily. Strong understanding of G-Code programming, proper tool selection, and proper feeds and speeds for optimal milling quality and productivity. Gauged and maintained tolerances on grinding diameters, depths, squareness, and parallelism. Interpreted and followed blueprints and technical specifications provided. 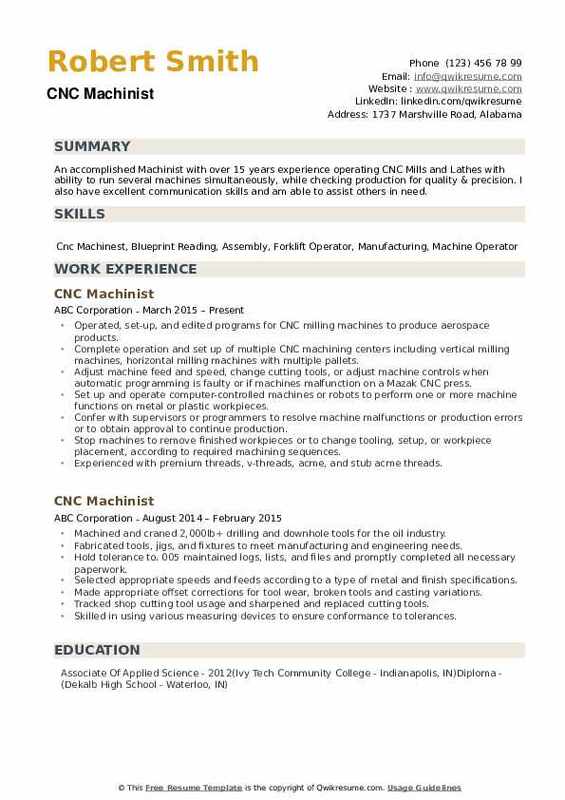 Employed as a cnc machinist, doing setups, running, and programming a Cincinnati milacron lancer 1250 vertical machining center. Made and painted various oilfield pump parts including barrels, liners, pull tubes, polished rods and gas anchors. Routinely monitored to feed and speed of machines during the machining process. Mainly worked with mills and very comfortable around them but know my way around a lathe as well. Adjust machine feed and speed, change curing tools, or adjust machine controls when automatic programming is faulty or if machines malfunction. Objective : Hardworking and self-motivated machinist seeking an full-time position and determined to produce and repair all mechanical equipment with precision and keen attention to detail. Machine Operator with positive attitude and a commitment to safety, quality, customer service and lean manufacturing. Excelled as a machine operator, inspector, problem solver, setup, fixturing, tooling requirements and cost per part requirement. Machine parts to specification using machine tools such as CNC lathes, CNC mills, engine lathes, Bridgeport mill, and drill presses. Familiar with Fanuc controls. Machined custom feed screws for the injection molding industry per blueprints and engineering instructions. Perform in production responsibilities involving inspection and gauging of various parts. Audited requirements for future jobs, allocated materials and addressed unexpected issues with suitable solutions. Skilled at reviewing technical specifications and drawings to decide on the fastest and most cost-effective manufacturing method. Program, set-up, and operation of computer controlled vertical and horizontal mills. Written approximately 800 programs at machine for machining center. Summary : A skilled CNC Machinist with sixteen years' experience in various manufacturing industries which includes eight years in the field of aerospace machining and two years in medical prosthetics. Areas of expertise include lathe machining and an ability to quickly grasp new machining concepts. Highly motivated to acquire new skills and take on new challenges and responsibilities to become more valuable in an ever-changing job market. Worked directly from blueprints, patterns, sketches, and specifications. Operated heavy duty lathes, mills, shapers and grinders. Measured instruments to verify compliance with precise specifications. Adhered to all safety protocols and safe work practices to reduce the likelihood of injury. Studied blueprints, work instruction, sketches, drawings, and manuals to determine dimensions and tolerances. Operated hand tools, drill presses. Removed burrs on all machined parts. Routinely monitor the feed and speed of machines during the machining process. Extensive set-ups including finding work centers, tooling, creating first article pieces with minimal product loss. Used manual, digital and computerized equipment to check dimensions and surface finish of components were within specified tolerances before quality control inspection. 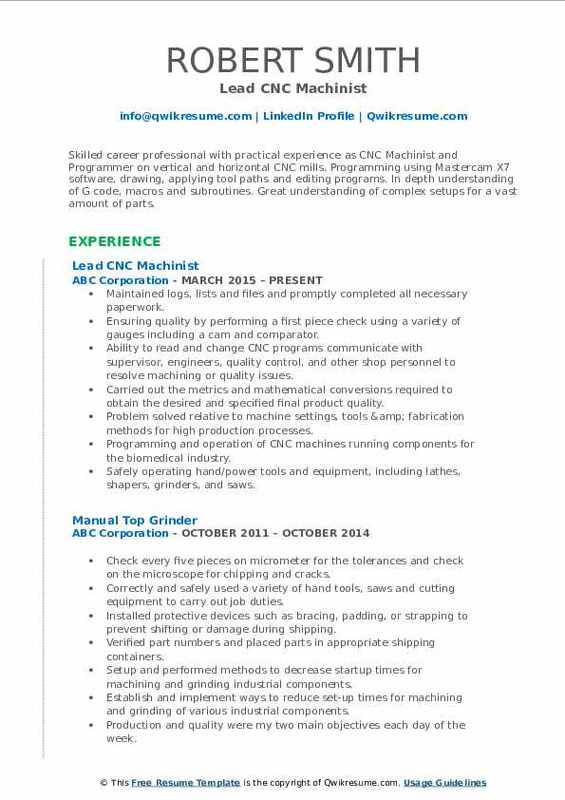 Summary : Machinist with over 17 years of proven work quality and leadership skills. Strong work ethic with a long track record of effective problem solving and positive results in various levels of manufacturing process. Recognized by operators as a person for fielding questions, diagnosing problems, and guiding team members through necessary steps to resolve issues. Acted as set-up instructor for other operations communicated effectively with engineering, supervisors and manufacturing staff to exchange technical information. Inspected manufactured parts and identified defects; corrected, reported and made necessary adjustments. Maintained and adjusted machine programs, set-up and programming to ensure correct tolerances. Checked to measure tools and documented in compliance with iso 9001 - quality manuals. Operated CNC lathe, Fanuc control maze control to manufacture parts to specific blueprints specs to within. 01. Examined and verified all completed parts to ensure compliance with specifications and quality. Summary : An accomplished Machinist with over 15 years experience operating CNC Mills and Lathes with ability to run several machines simultaneously, while checking production for quality & precision. I also have excellent communication skills and am able to assist others in need. Operated, set-up, and edited programs for CNC milling machines to produce aerospace products. Complete operation and set up of multiple CNC machining centers including vertical milling machines, horizontal milling machines with multiple pallets. Adjust machine feed and speed, change cutting tools, or adjust machine controls when automatic programming is faulty or if machines malfunction on a Mazak CNC press. Experienced with premium threads, v-threads, acme, and stub acme threads.